We are now in the year 2016, but it sure as heck does not look as though many of the ideas from the Back to the Future science fiction series has managed to take off, although the hoverboard has somewhat gained some progress – but it is not mainstream as yet, and self-tying shoelaces? Good luck seeing them being a standard issue feature on new pairs of shoes. 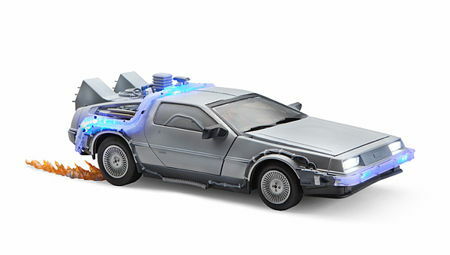 Still, this does not mean that the series has a small fan base – far from it, as you can tell by the release of the $69.99 Back to the Future Iced DeLorean Collector Set. This is the 1/15th replica of the Version 1 Time Machine, where it sports a thin coating of “frost” over its entire surface. It will also boast of its fair share of lights, sound effects, and fully-detailed moving parts, where it will also be accompanied by yellow flaming tire tracks, a license plate, and a case of plutonium – with the plutonium not being real, of course. The gull-wing doors and hood will open indeed to up the realism ante, as this is an officially licensed Back to the Future merchandise. Powered by a trio of AA batteries, it is the perfect gift for your Back to the Future loving half this Valentine’s!